On July 16, General Assembly of Citrineland Corporation and Flaminia Realty was a successful event at Social Hall Calyx Center, I.T. Park Cebu. The full force of Citrineland Corporation Marketing Staffs were there to happily announce the SERENIS Beyond Green Tropical Living Residential Project in Cebu North. The said event was attended by mostly Flaminia Sales Executives and Brokers mostly from the North area. It was less than an hour Product Knowledge Seminar focusing on SERENIS along with brief introduction to other existing and future projects by Citrineland. Ms. Hermie Anne Sareno, Property Advisor of Citrineland, hosted the entire event with marketing updates reported by Citrineland Marketing staff, marketing sales advises from Innoland External VP for Sales and Marketing, Mr. Wilson Granados and open forum in the latter part of the event. While doing the Q & A portion of the event, attendees were also having their gratis lunch inside the Social Hall. It was indeed a motivating & inspiring Saturday Morning Talk at Calyx Centre! Here we go now the market updates as of July 2016. 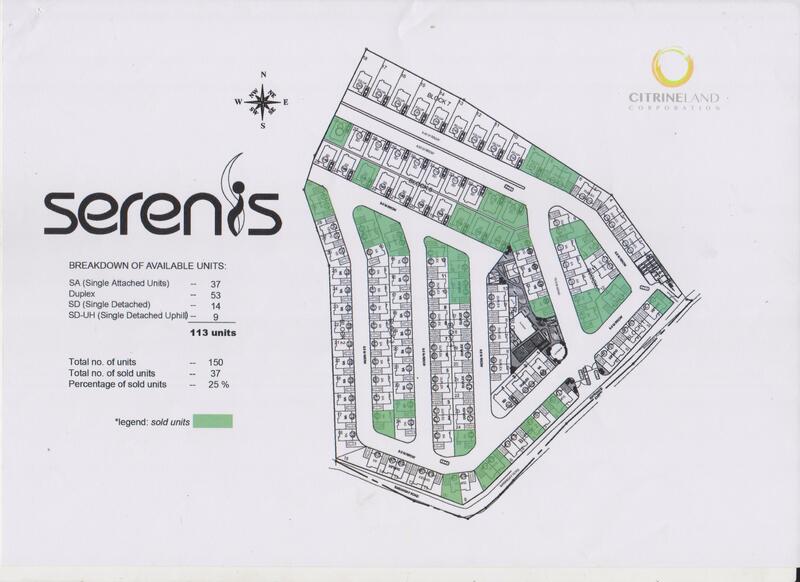 The SERENIS Residential Project has 150 units of four different house types with a total land area of 2.3 hectares located in Sitio Tabok Lamak, Brgy. Yati, Liloan. As of July 16, only 9 units left for Single Detached Uphill (RUBY), 14 units left for Single Detached (AMETHYST), 37 units left for Single Attached (Sapphire), and 53 units left for Duplex (TOPAZ). To better locate which house type, see the SERENIS SALES SITE MAP . Price ranges from Php 2.8-7.6 million, see current SERENIS PRICELIST. With minimum monthly salary of Php 50 thousands to up, you can have this serene tropical living in Cebu North. How? Just …..
← Celebrating 3rd International Travel Festival – Cebu, Philippines.